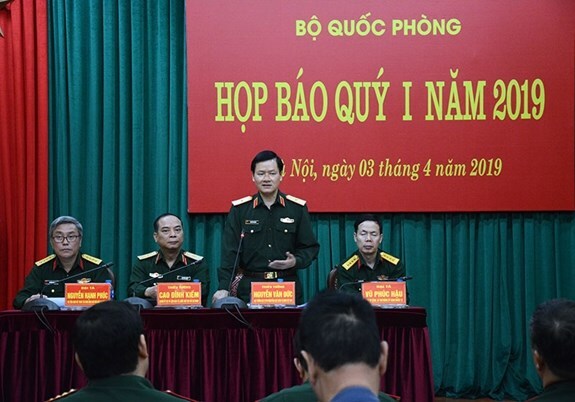 Hanoi (VNA) – A range of activities will be held to mark the 60th anniversary of the Ho Chi Minh Trail and traditional day of Truong Son soldiers (May 19), heard a press conference held by the Ministry of National Defence in Hanoi on April 3. One of the major activities include a national scientific workshop on the legendary trail slated for May 13. It will be co-organised by the Vietnam Military History Museum, the Party Central Committee’s Commission for Information and Education, and the Party Committee of the Central Highlands province of Dak Nong. There will be an exhibition at the Ho Chi Minh Trail Museum, art exchanges in the central province of Nghe An, a candle-lighting ceremony at the Truong Son National Martyrs’ Cemetery in the central province of Quang Tri, a writing contest, a meeting of war veterans, and a commemorative ceremony to be held by the defence ministry. The press conference also brought up the settlement of consequences of bombs and mines left over from the war. Colonel Nguyen Hanh Phuc, deputy director of the Vietnam National Mine Action Centre, said work in this field has been carried out with the joint efforts of people from all aspects of society. Apart from activities in response to International Mine Awareness Day (April 4) in Hanoi and other localities, Vietnam has focused on implementing bomb and mine clearance projects. This includes a project on the settlement of bomb and mine consequences in the central provinces of Quang Binh and Binh Dinh with the total funding of 20 million USD sourced from the Republic of Korea (RoK) through the Korean International Cooperation Agency (KOICA). A programme on building an information system to manage bomb and mine contamination, as well as developing equipment and facilities to serve bomb and mine clearance has also been implemented by the defence ministry. The country will continue to cooperate with partners and expand relations with potential partners in this field, while pushing ahead with the implementation of relevant memoranda of understanding (MoU) it has signed.